PaintExpo 2016 received top scores 10,522 visitors coming from 74 countries and 501 exhibitors. 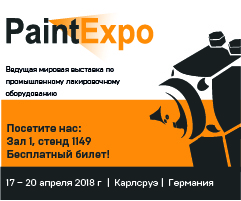 Growth of the world’s leading trade fair for liquid painting, powder and coil coating technology is making itself apparent even in its 7th edition, that is expected to be the biggest and most international PaintExpo so far. More than 520 companies in these fields from 29 countries will occupy 15,000 square meters in 3 exhibition halls. Arsonsisi will present its latest developments from the entire range of liquid paints, powder coatings, liquid and electrocoating paints at the Stand n. 1149 — Hall 1, Karlsruhe Exhibition Centre. Click on the banner and download your free ticket to attend the fair!